Chocolate covered chocolate marshmallow bunnies. Each box comes with 5 bunnies individually wrapped making them the perfect Easter basket candy. These are perfect for the chocolate lover, a chocolate marshmallow inside covered with a cream milk chocolate. 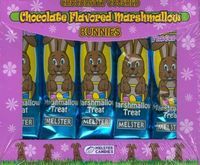 If you are a marshmallow lover we also carry everyone's favorite marshmallow peeps, chocolate covered marshmallow bunnies and marshmallow eggs.